It’s Friday at CatTime.com, and that can only mean one thing: Five cat videos. Each week we sift through the best YouTube videos starring furry felines engaged in a variety of activities. Today we have a Bengal cat “talking” to her kittens, a cat playing with a younger German Shepherd, a kitten reluctant to take a bath from her Savannah mama, a Savannah cat and German Shepherd dog hard at play, and the “Cat & Mouse” episode from the animated series Simon’s Cat. Click on any of the links below to watch the corresponding video. 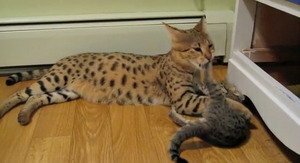 A kitten doesn’t want to take a bath, so her Savannah mama must force the issue.